Readings: Isa 7:10-14; Heb 10:4-10; Lk 1:26-38. 1/ First Reading: NAB Isaiah 7:10 Again the LORD spoke to Ahaz: 11 Ask for a sign from the LORD, your God; let it be deep as the nether world, or high as the sky! 12 But Ahaz answered, "I will not ask! I will not tempt the LORD!" 13 Then he said: Listen, O house of David! Is it not enough for you to weary men, must you also weary my God? 14 Therefore the Lord himself will give you this sign: the virgin shall be with child, and bear a son, and shall name him Immanuel. 2/ Second Reading: NAB Hebrews 10:4 for it is impossible that the blood of bulls and goats take away sins. 5 For this reason, when he came into the world, he said: "Sacrifice and offering you did not desire, but a body you prepared for me; 6 holocausts and sin offerings you took no delight in. 7 Then I said, 'As is written of me in the scroll, Behold, I come to do your will, O God.'" 8 First he says, "Sacrifices and offerings, holocausts and sin offerings, you neither desired nor delighted in." These are offered according to the law. 9 Then he says, "Behold, I come to do your will." He takes away the first to establish the second. 10 By this "will," we have been consecrated through the offering of the body of Jesus Christ once for all. 3/ Gospel: NAB Luke 1:26 In the sixth month, the angel Gabriel was sent from God to a town of Galilee called Nazareth, 27 to a virgin betrothed to a man named Joseph, of the house of David, and the virgin's name was Mary. 28 And coming to her, he said, "Hail, favored one! The Lord is with you." 29 But she was greatly troubled at what was said and pondered what sort of greeting this might be. 30 Then the angel said to her, "Do not be afraid, Mary, for you have found favor with God. 31 Behold, you will conceive in your womb and bear a son, and you shall name him Jesus. 32 He will be great and will be called Son of the Most High, and the Lord God will give him the throne of David his father, 33 and he will rule over the house of Jacob forever, and of his kingdom there will be no end." 34 But Mary said to the angel, "How can this be, since I have no relations with a man?" 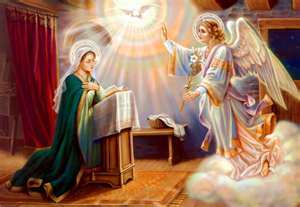 35 And the angel said to her in reply, "The Holy Spirit will come upon you, and the power of the Most High will overshadow you. Therefore the child to be born will be called holy, the Son of God. 36 And behold, Elizabeth, your relative, has also conceived a son in her old age, and this is the sixth month for her who was called barren; 37 for nothing will be impossible for God." 38 Mary said, "Behold, I am the handmaid of the Lord. May it be done to me according to your word." Then the angel departed from her. I. THEME: Obedience brings salvation to human beings. God bestows on people the freedom to choose; but when people choose, they must get the result of their decision. In order to choose the right thing, people should rely on God’s teaching; but people have a temptation to decide by themselves because they don’t want to listen to anybody. In the temptation of the Garden, the wicked serpent knew that the woman, Eve, didn’t want to obey God, tempted her to eat the fruit of the tree called “kwowing good and evil” which God forbade her to eat. The results of this disobedience were: they lost their good relationship with God, they have to work hard to earn a living, they transmitted the original sin to all their descendants, etc. Today readings center on obedience and disobedience of God. In the first reading, even though king Ahaz was commanded by the prophet Isaiah to believe only in God, he disobeyed and sent his messenger to Egypt to ask for help. The results were: the nation was destroyed and people were exiled in Babylon. In the second reading, the author of the Letter to the Hebrews compared the sin offerings of the Old Testament with Christ’s obedience, and concluded that God esteems Christ’s obedience more than thousands of sheep and oxen, and his death on the cross has power to wipe out all sins and to bring salvation to all people. In the Gospel, the reply “Fiat!” of the Blessed Mary in the Annunciation began the era of salvation. The Holy Spirit overshadowed her and the Infant Jesus, the Son of God, was conceived in Mary’s womb. 1/ Reading I: King Ahaz disobeyed God’s command through the prophet Isaiah. 1.1/ King Ahaz doubted God’s power: Rezin was the last king of Damascus. On 732 BC, the Assyrian king, Tiglath-pileser III destroyed Damascus and killed king Rezin. The association between Assyria and Israel made the king of Judah worry, he was afraid this association will destroy his country. The leaders of the association planned to discarded Ahaz, and replaced him with the prince of Bet Tabel, a territory of Aram in the north of Transjordan area. This prince probably belonged to Judah’s tribe, Jotham’s son or the son of king Uzziah with the princess of Tabel. The prophet Isaiah was sent by God to king Ahaz to encourage him to firmly believe in God since He is the only One who can protect the whole Judah’s territories. King Ahaz didn’t believe in God’s power and Isaiah’s advice; instead, he sent his messenger to Egypt to ask for protection. The result for his disobedience was that God let his kingdom fall to the Babylolian king. 1.2/ Isaiah was sent by God to king Ahaz the second time. (1) A sign is needed to light up one’s faith: Again the Lord spoke to Ahaz:“Ask for a sign from the Lord, your God; let it be deep as the nether world, or high as the sky!”But Ahaz answered, "I will not ask! I will not tempt the Lord!" The king refused to ask for a sign because he was stubborn; he didn’t want to listen to Isaiah’s advice. Isaiah didn’t use the special noun to indicate a virgin “betula,” but used the noun “alma” which means a young girl who comes to an age to get marry, whether a virgin or not. This oracle was announced before the king’s household, and it can imply that the David’s lineage shall be terminated. If this is going to happen, God’s promise to David shall be ended (2 Sam 7:12-16). The child who was going to be born could be Hezekiah whom Judah was hoping to continue God’s presence with His people and the continuity of God’s promise with David. However, the seriousness of the oracle and the name of the future child “Emmanuel” showed us that Isaiah’s prophecy wasn’t stopped with the birth of Hezekiah, but pointed to the ideal king of David’s lineage. Through this king, God is actually living among His people. St. Matthew and the Church saw the birthday of Jesus Christ by the Blessed Virgin Mary is the fulfillment of Isaiah’s prophecy as we shall discussed below. 2/ Reading II: Doing God’s will is more important than offering thousands of animals. 2.1/ Animal blood can’t take away all human sins: In the Old Testament, if people want their sins to be forgiven, they must come to the temple to offer sacrifices; but the animal blood can only take away unintentional sins which people committed against God and others, no offering can take away their intentional sins. This is the reason why the author of the Letter to the Hebrew wrote: “for it is impossible that the blood of bulls and goats take away sins.” Therefore, people need another way for their sins to be forgiven, and God prepared an effective way to forgive all people’ sins. The author continued: “For this reason, when he came into the world, he said: "Sacrifice and offering you did not desire, but a body you prepared for me.” Christ needed a body so that he could communicate with people, and specially to suffer, to die and to redeem people. Firstly, the author of the Hebrews said, “Sacrifice and offering you did not desire, but a body you prepared for me;holocausts and sin offerings you took no delight in.” This is so obvious because all animals belong to God. When people offer these offerings, they take what belong to God to offer back to Him. Moreover, many times people committed more sins when they unworthily offered sacrifices as many prophets accused people, such as: Some offered blemished animals; some offered sacrifices and at the same time were plotting to rob people; some offered sacrifices with an intention to fulfill the law, not out of their love for God, etc. Jesus’ obedience is the only sacrifice that delights God the most, and his blood is needed to pour out only once so that God can forgive all people’s sins. Obedience to God’s will is the only way to reconciliate with God; He wants people to believe in Christ and to obey what he revealed and taught. 3/ Gospel: Mary’s answer, “Yes!” begins God’s plan of salvation. 3.2/ The mystery of salvation was revealed: The angel Gabriel talked about the child which is about to be born as follows: “And behold, you will conceive in your womb and bear a son, and you shall call his name Jesus.He will be great, and will be called the Son of the Most High; and the Lord God will give to him the throne of his father David,and he will reign over the house of Jacob for ever; and of his kingdom there will be no end.” This is the third promise which the prophet Nathan announced to king David in the first reading. The only strange and unexpected thing about the child is, though he was the son of the Most High but belonged to David’s lineage through Joseph, his adopted father. 3.3/ The reaction of Blessed Virgin Mary: Due to her vow of virginity, Mary asked the angel Gabriel: “How shall this be, since I have no husband?” Mary’s vow of virginity pleased God because He wants His Son to be incarnated in such an immaculate and pure womb. Moreover, the prophet Isaiah also foretold about this (parthenos, Isa 7:14). After listening the angel’s explannation, the Virgin Mary said to him: “Behold, I am the handmaid of the Lord; let it be to me according to your word." And the angel departed from her. - We must obey God because He is the only one to know what is good for us; to disobey Him is to get all unwanted results. - Obedience to God doesn’t take away our freedom but shows our wisdom. Like a child who isn’t mature to make his own decision, he must obey his parents who are wiser than him. Similarly, when we don’t understand God’s plan for our life, we should imitate Jesus and Mary to do God’s will. - Everything is possible to God. We should be patient to wait for God’s promises to be fulfilled.